Today I'd like to introduce you to Holly and Trisha, two Berlin-based bloggers from We Heart Home, a fabulous home design blog for the online store Fashion For Home. I love reading their interior design & decor posts so I was honoured when they offered to write a guest post for me. The home they've chosen is lovely and so unique... enjoy! Holly & Trisha here from Fashion For Home's lifestyle blog We Heart Home. We wanted to say a huge thanks to Michelle for having us today to share this wonderful Atlanta loft space with you. Originally purchased in the 1960s when it was still an office, painter Thea Beasley has boldly (and bravely) transformed this 3,500-square-foot suburban loft into a charming and elegant haven of neutral colours and natural, Scandinavian textures. 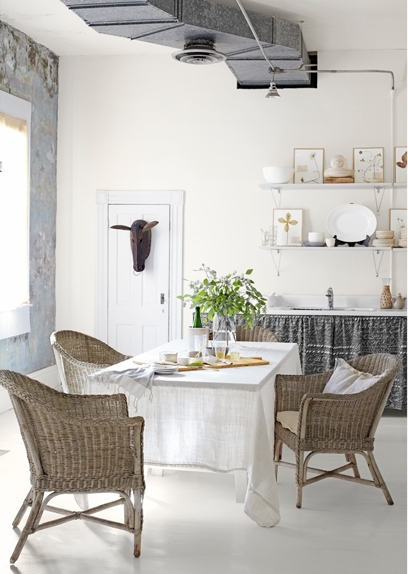 We adore these wicker chairs and white table linen - they remind us of a Bavarian cottage or fairytale home! 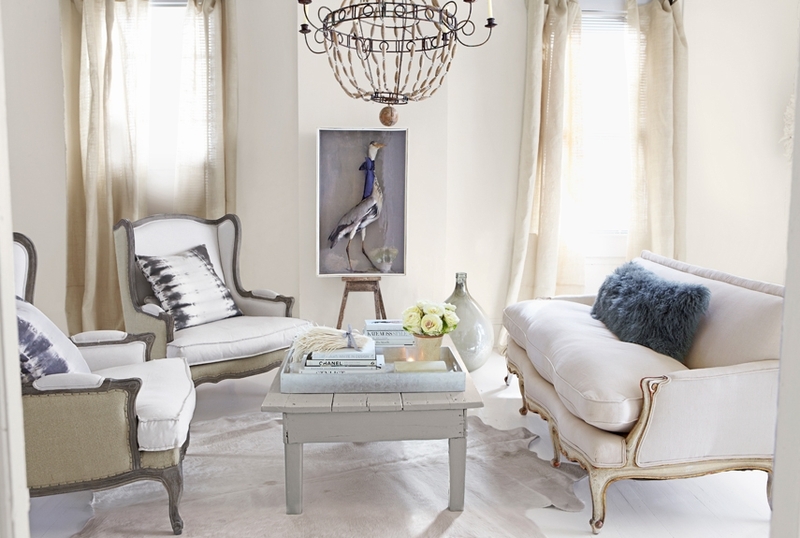 In every room Beasley has combined a simple palette with a wonderful feature of some kind, which really allows her to bring out her artistic side! The white walls and free-standing tub (below) are complimented by the eye-catching feature wall. The uniformity of the golden frames and the monochrome tones of all the images is the key to their success! One of our all time favourite features about this interior is the mottled walls. Beasley stripped them to reveal this unique plaster effect. While a lot of people think it looks a bit scruffy, we are convinced that given the elegance of her furnishings and the high ceilings means this effect works brilliantly. 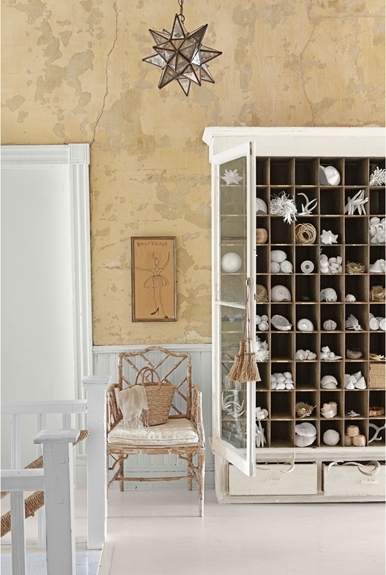 Once again, this room has a lovely feature in the form of her 1930s display cabinet with a total of 80 compartments, in which she exhibits shells, feathers, nests & even antlers. Even her clothes fit in with her colour palette and interior style - now THAT is devotion! The apartment-wide motif of faux fur, whether it be cushions, blankets or rugs really warms up the wooden and ceramic textures. The living room really stands out for us. It has a far more French aesthetic with the curvy lines and fitted upholstery of these Aidan Gray wingbacked chairs, white washed (homemade!) farmhouse coffee table and Mongolian-lambhair pillow. Beasley has such a great skill for mixing different aesthetics - how she managed to successfully mix this mounted African feather headdress with a Parisian black & white photo and leopard print chair... we will never know. But it looks fantastic!! Thanks for having us Michelle, its been an honour!